Nutri-Plus++ is a complete all-in-one multiple vitamin, mineral, essential amino acid, and blood-building supplement. It contains 100% of the suggested amount of Vitamin E (20,000 I.U.) and Selenium (36 mg per lb) for a stand-alone product. The Nutri-Plus++ electrolyte formula includes also 5% potassium, up to 50% more than is found in other electrolyte supplements. Potassium, one of the most important minerals in electrolytes, is essential and needs to be replaced in any performance horse who experiences sweat loss. Nutri-Plus++ is the complete vitamin, mineral, essential amino acid and blood-building supplement of choice and is made from human-grade nutriceuticals to assure the highest quality and effectiveness. Why Nutri-Plus++ is Different from All the Others? 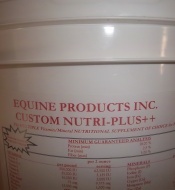 Feed two (2) ounces daily for performing horses. However, one (1) ounce is sufficient for horses not in full training. A measuring scoop is provided. 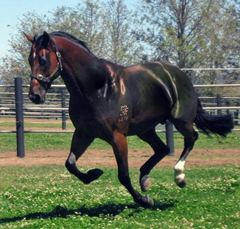 Total cost per horse = $22.95 per month or 76 cents a day when purchasing a 25 lb pail. VITAMINS PER LB. SERVING / 2 OZ. MINERALS PER LB. SERVING / 2 OZ.